An LC50 value is the concentration of a material in air that will kill 50% of the test subjects (animals, typically mice or rats) when administered as a single exposure (typically 1 or 4 hours). Also called the median lethal concentration and lethal concentration 50, this value gives you an idea of the relative acute toxicity of an inhalable material. This is closely related to the LCLo value which is the lowest concentration reported to have killed animals or humans. This value applies to vapors, dusts, mists and gases. Solids and liquids use the closely related LD50 value (50% lethal dose). Other variants that are occasionally used are the LC25 and LC75 which refer to the lethal concentration that kills 25% and 75% of test subjects, respectively. The formula for the determination of an LC50 is rather complex and can be found in 49 CFR 173.133(b)(1)(i). Typical units for LC50 values are parts per million (ppm) of material in air, micrograms (10-6 = 0.000001 g) per liter of air and milligrams (10-3 = 0.001 g) per cubic meter of air (see volume units and mass units). New testing regimes, such as the Acute Toxic Class (ATC) and Up Down methods, have been developed which use fewer animals and provide more reliable toxicity class assignments than the traditional LC/LD50 methods. See the links under Further Reading below. Never be exposed to an LC50 dose of a hazardous chemical -- by definition, there is a 50% chance this will kill you...and if you survive you're not going to be in good shape. Pay close attention to the permissible exposure level (PEL) instead. This is a more realistic determination of the maximum safe exposure to a material and is usually based on the known effects of the chemical on humans rather than laboratory animals. Get your D.O.T. hazardous material placards & labels at Safety Emporium. The U.S. EPA's Terminology Reference System entry on LC50 has detailed information including links to the U.S. Federal regulations for experimental determination of toxicity values. The Canadian Centre for Occupational Health and Safety's What is an LD50 and LC50 is quite readable. Acute oral toxicity, a research article in Environ Health Perspect. 1998 April; 106(Suppl 2): 497-503. 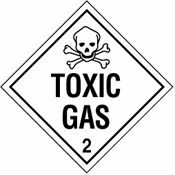 List of highly toxic gases at Wikipedia. Try your hand at Toxic Trivia here at ILPI. See also: LD50, mus (mouse), PEL, STEL, TLV.